Much needed was falling throughout the day around Maine. 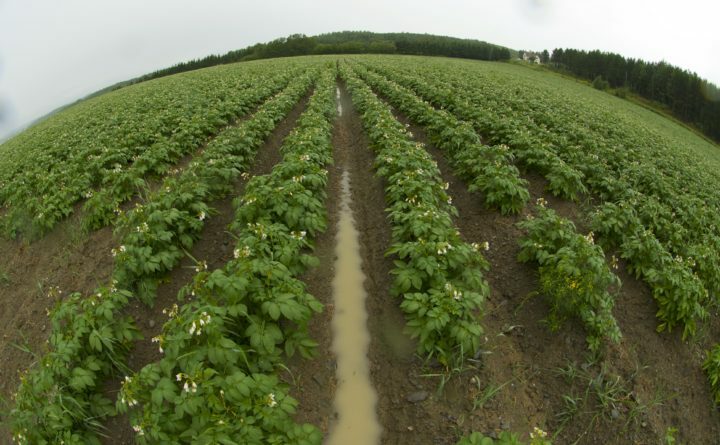 In northern Aroostook County, farmers say the dry July conditions could mean smaller potatoes and lower yields. Even as heavy rains were falling over much of northern and western Maine Thursday afternoon, the United States Drought Monitor map was showing abnormally dry conditions from Kittery to Fort Kent. “Except for Washington County, every county in Maine is experiencing drought or abnormally dry conditions in at least part of the county,” according to Suzanne Krauss, director of the Maine Emergency Management Agency. This is the third summer in a row Maine has experienced drought condtiions, according to Krauss. The 2016 dry spell was the first drought since 2002. Conditions are especially bad in northern Aroostook County where there have been lower than normal strawberry yields and potato farmers need a steady rain to provide moisture the tubers need over the next four weeks to gain size. Before Thursday’s rain, Aroostook County had received less than an inch and a half of rain for all of July, according to National Weather Service office in Caribou, compared to the normal average of 3.08 inches. Temperatures are also above normal for July, averaging 69.7 degrees, 4.2 degrees above average. It’s not just the Aroostook County farmers taking a hit with the dry conditions. As of this past Wednesday, the 7-day average streamflow conditions in Maine are in extreme to moderate hydrologic drought conditions, according to the US Geological Survey. Hydrological drought refers to shortages of water resources when groundwater, reservoirs or stream levels are significantly reduced and affect drinking water supplies. Wells around the state are showing below normal levels, according to the USGS. The conditions are expected to improve, according to Tom Hawley of the National Weather Service in Gray. The next several days could bring 1- to 2-inches of rain to Maine, with southern coastal areas getting the greatest amount. Members of the state’s drought task force, a group that operates with MEMA, is monitoring the conditions. Well owners are also encouraged to share any water concerns with their local emergency managers or municipal officials. Information on conserving household water is available from MEMA at www.maineprepares.com.